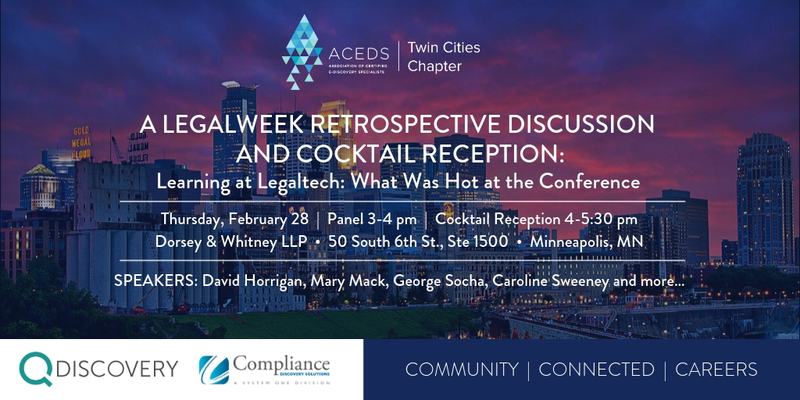 Join the ACEDS Twin Cities Chapter on Thursday, February 28th for a Legalweek Retrospective Discussion and Cocktail Reception: Learning at Legaltech: What Was Hot at the Conference. The panel will be from 3-4pm followed by a cocktail reception from 4-5:30pm with hors d’oeuvres. George Socha is a managing director in BDO’s Forensic Technology Services practice. Named an “E-Discovery Trailblazer” by The American Lawyer, he assists corporate, law firm, and government clients with all facets of electronic discovery, including information governance. George has served clients in a variety of industries including pharmaceutical, energy, retail, banking, and technology, among others. As a renowned industry thought leader, George has authored more than 50 articles and spoken at more than 200 engagements across the world on a variety of e-discovery topics. His extensive knowledge has also been utilized more than 20 times to provide expert testimony. 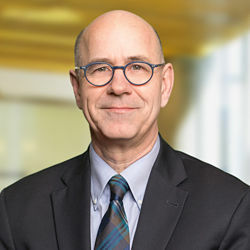 Co-founder of the Electronic Discovery Reference Model (EDRM), a framework that outlines the standards for the recovery and discovery of digital data, and the Information Governance Reference Model (IGRM), a similar framework specific to information management, George is skilled at developing and implementing electronic discovery strategies and managing electronic discovery processes. Prior to joining BDO, George spent 16 years as a litigation attorney in private practice before starting his own consulting firm focused on e-discovery issues in 2003. George has also served as a guest lecturer at universities across the United States. Caroline Sweeney is responsible for the delivery of Dorsey’s e-discovery services, including LegalMine Managed Review services, litigation technology support, and trial technology support. Caroline is a member of Dorsey’s Electronic Discovery Practice Group and the Cybersecurity, Privacy and Social Media Practice Group. She has extensive experience consulting with attorneys and clients with regard to e-discovery, including identification, preservation, collection, processing, review and production of electronically stored information. Her 25+ years of experience in the litigation support industry, include working in the law firm and litigation support vendor environments. Caroline is actively involved in the e-discovery community. She is ACEDs certified, currently Co-President of the Twin Cities ACEDs chapter, and participated in the development of the litigation support certification test for the Organization of Legal Professionals (OLP). Mary Mack is a long-time industry expert with over 25 years of experience and leadership to her credit. Under her leadership, ACEDS furthers its commitment of building an international community of e-discovery practitioners for the exchange of training, certification, professional development and networking. Mack is known for her strength in relationship and community building, as well as for the depth of her e-discovery knowledge. 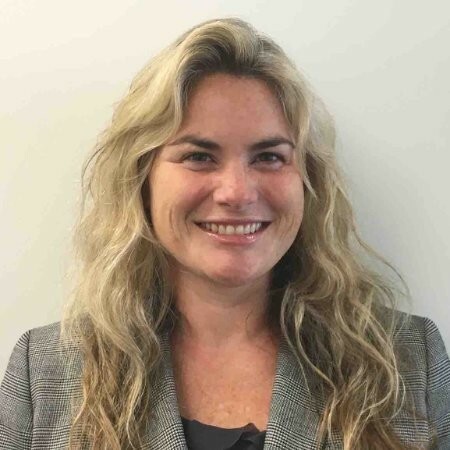 Before joining ACEDS, Mary was the Enterprise Technology Counsel for ZyLAB, a global eDiscovery and Intelligent Information Governance software company focused on helping organizations insource eDiscovery to reduce legal spend and prevent privacy breaches and IP leakage. Prior to eDiscovery, Mary designed, coded, tested and maintained mission critical enterprise systems for banks, health insurers and pharmaceutical companies. Certified in eDiscovery, security, access and identity management, forensics and computer telephony, Mary is admitted to the Illinois bar and a graduate of Northwestern University School of Law. 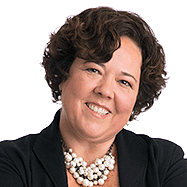 Mary is the author of A Process of Illumination: The Practical Guide to Electronic Discovery and the co-editor of Thomson Reuters West’s eDiscovery for Corporate Counsel. Michele C.S. Lange is a freelance writer and attorney based in Minneapolis, MN. 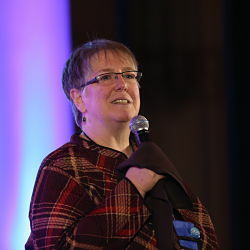 She has more than 15 years of experience in the legal technology industry, where she regularly wrote articles, blogged, podcasted, and spoke on topics related to eDiscovery, computer forensics, and technology’s role in the law. Most notably, she authored the American Bar Association book, "Electronic Evidence and Discovery: What Every Lawyer Should Know." Solving complex problems, building cutting-edge tools, and helping clients navigate sticky situations, Lange also has worked extensively in the areas of cybersecurity, information governance, privacy, security, and artificial intelligence. Currently, she writes columns for law.com, Minnesota Lawyer, and other media companies, as well as consults and writes for organizations, helping them look for ways technology can create efficiencies and reduce legal and IT costs. Her passions: inquisitive kids, playful pups, red licorice and anything with words. 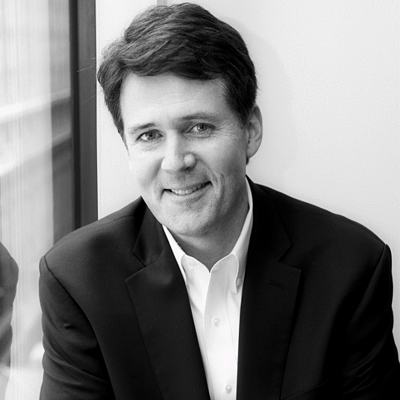 Zach Warren is the editor-in-chief of Legaltech News, a national magazine of ALM Media. In his role, he helps explore the intersection of law and technology, writing and editing feature and daily articles for Legaltechnews.com and in The American Lawyer and Corporate Counsel print magazines. Before LTN, Zach worked at InsideCounsel magazine and sports analytics startup numberFire. He currently lives in Minneapolis and received his undergraduate degree from Northwestern University. Experienced attorney, consultant, evangelist and SME who enjoys working closely with organizations having challenging eDiscovery, data privacy/protection, cybersecurity, compliance, and retention/disposal issues. This includes governing sensitive information and processes for GDPR, PCI, PII, HIPAA, Financial and other regulatory compliance. 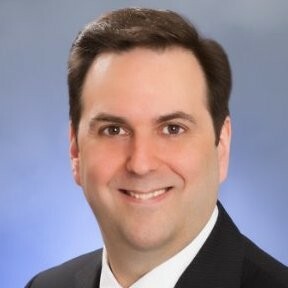 David Horrigan is Relativity's e-discovery counsel and legal education director. An attorney, law school guest lecturer, e-discovery industry analyst, and award-winning journalist, David has served as counsel at the Entertainment Software Association, reporter and assistant editor at The National Law Journal, and analyst and counsel at 451 Research. He has been published or cited by many publications and the law reviews of numerous universities. He is licensed to practice law in Washington D.C.